Matt Davignon's music is "fragile and gorgeous and stubbornly weird," according to the SF Bay Guardian. 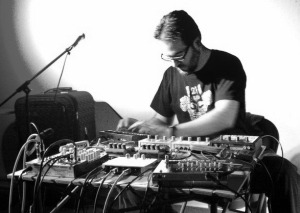 He's best known for combining drum machine and pre-recorded source material with a variety of electronic processing devices to create shifting layers of organic and expressive sounds. His music is inspired by field recordings, natural sound phenomena, irregular and imperfect rhythms, and psychedelic, drone and space music. In addition to his solo work, Matt frequently collaborates with other improvisers. With Hugh Behm-Steinberg, he manipulates speech recordings in the band Oa (https://edgetonerecords.bandcamp.com/album/oa). He was also a member of the improvising avant-rock quartet Tiny Owl (http://tinyowl.bandcamp.com).